Can you believe it is August? We've been getting a tiny taste of Spring in the last few days. This is the usual weather pattern here - we usually get some beautifully mild days in August before the last weeks of winter return, to farewell us in a hurry at the beginning of September. In north Queensland, winter doesn't waste any time in long goodbyes. My mind has turned to my summer wardrobe, which I know is lacking in the tops department. I'm unimpressed with the way fabric wears out these days - synthetic knits from the shop just can't stand up very long to the hot summers we enjoy (or not, in my case). I find it irritating because I used to be able to get several seasons out of my everyday summer clothes. The quality has disappeared as everything has gotten supposedly cheaper (more expensive, really, as you have to buy more!). I am lucky that both my Mum and one of my sisters are clever with a sewing machine and a pair of scissors, and so I have gathered quite a few handmade summer clothes into my wardrobe over time. Homemade cotton dresses are delightful to wear on summer days, and as making clothes for a living is what my sister used to do, I feel really good in the dresses too because they're made so well. The only craft I am clever at is knitting, and so I happened to be having a conversation with my family about my wardrobe dilemma just the other day. I mentioned that I had the mad idea to knit myself some summer tank tops. I was met with startled faces and suppressed (although not very well suppressed) laughs. You see, I have an infamous supply of chocolate brown organic cotton. 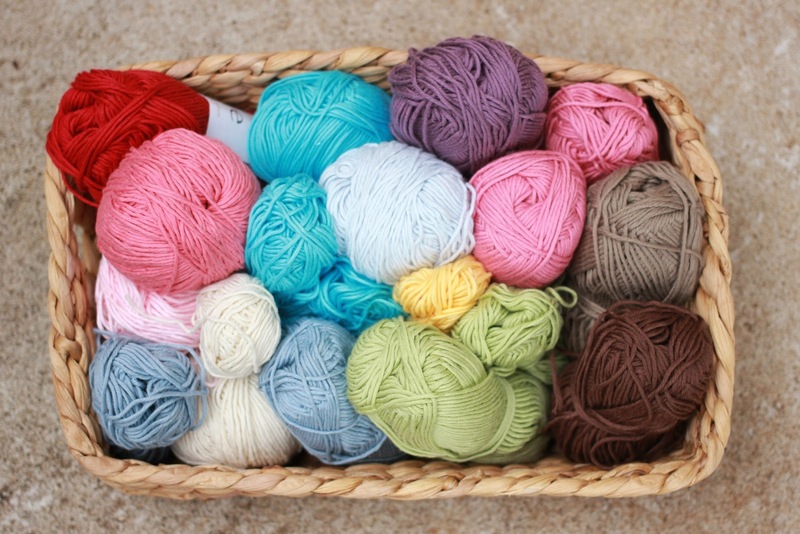 I bought it in bulk several years ago when I was selling my hand knitting baby items. Organic cotton and bamboo were what I mainly made things in, as it was something I could still work with over summer and could sell the best at our local markets as we are in the subtropics. When this particular cotton brand decided to discontinue this perfect line of yarn, I bought it in bulk from my wholesaler. Of course, I ordered more colours than brown, but as is bound to happen I've used most of the colours up and still got a packet or two of the brown left. It's a lovely colour, and I'm not opposed to brown. (It's what I made my shrug out of). But we all started to envisage me in a summer uniform of shorts with me-made brown cotton tops to go with it. There is enough yarn for me to make a shirt to wear every day of the week out of. The other problem behind my family's amused smiles was that they have no imagination and can't envisage a lovely hand knitted summer top. 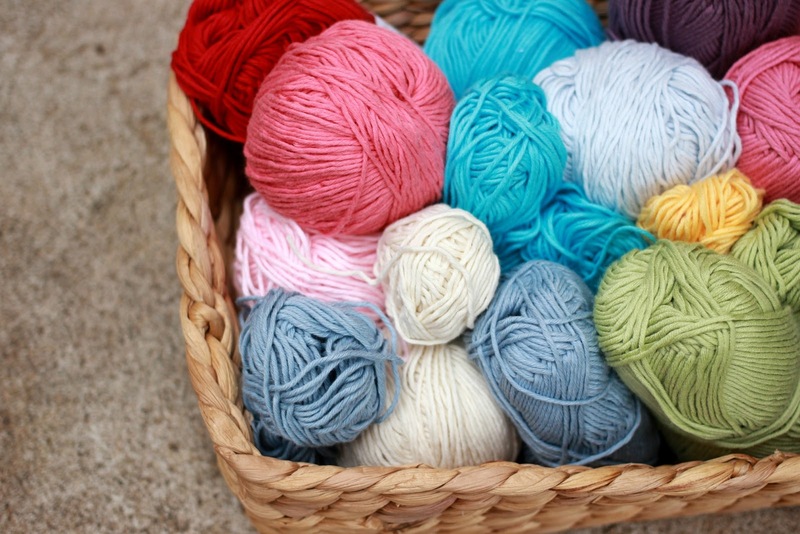 As non-knitters, they suffer from the impression that knitting is a winter activity and only ever involves wool. The conversation has turned what was a casual remark made by myself into a challenge. Last night I jumped onto Ravelry and searched for summer patterns. I found several pretty options, with my favourite and one that I simply must make being a lace cropped top that you wear over the top of a singlet. I find that mode of clothing very cool in summer, and I would love to have it in my wardrobe. Being cropped also means it doesn't use much yarn so I may be able to do a stash dive and find some coloured cotton to knit it in if I am very lucky. (Don't be fooled by the basket of colours - they're all scraps! I couldn't even knit a doll an outfit out of some of them). Otherwise, my other thoughts are running along the lines of knitting a multi coloured striped top, where I can turn those scraps into something useful. At any rate, I've taken on the challenge and I'm looking forward to making some summer tops once the hot weather kicks in. They shan't all be brown, in case that's what you were thinking. I said I don't mind brown, but I don't want a summer uniform of brown knitted tops. Happy summer (and winter!) knitting Sarah! Cotton knitting for Summer sounds like a good plan, what about a brown and cream stripe look....that might be an option.....have fun! Those sound like good plans! Your post was a pleasure to read.